Home » Foreign Forces » Iran: Atomic and Underwater? Look at the Iranian SSN project through a Greek lens. Fear merges with interest for Tehran. Iranian leaders fear American dominance of nearby waters—dominance Washington intends to perpetuate according to the 2007 Maritime Strategy, which pledges to stage “credible combat power” in the Indian Ocean and Persian Gulf for the foreseeable future. Tehran hopes to raise the costs of entry into these seas. If it convinces Washington that the costs will be high, it can hope to prompt a change in American behavior. Much as China is doing in East Asia, Iran is playing head games with U.S. leaders. Deftly used, military forces buttress diplomacy. The diplomatic messaging for an SSN-equipped Iran would go something like this: You can deploy U.S. naval forces near our shores, but you will pay a heavy if not unacceptable price. 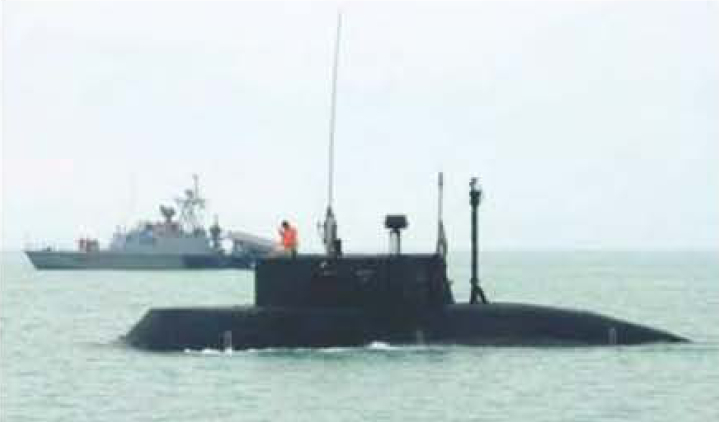 Iran’s three Russian-built Kilo­-class diesel boats, the mainstay of its undersea fleet, have limited range and endurance relative to nuclear boats. But by going underwater in a major way, Tehran can hope to inflict serious damage on superior U.S. task forces that venture into the Arabian Sea or the gulf. An SSN force could lurk silently offshore for long stretches of time, waiting for adversary forces to come within torpedo or missile range. Knowing that, Washington might hesitate in times of crisis—or desist altogether from efforts to enter the gnetulf. And deterrence would suit Tehran just fine. What about honor, Thucydides’ third prime mover for states’ actions? Iranians—across the political spectrum, from glowering mullahs to relatively liberal youth—are acutely conscious of their nation’s luminous history, when the Persian Empire bestrode the Middle East and even threatened to overrun Europe. (Thucydides himself briefly recounts how a Spartan-Athenian alliance repulsed successive Persian invasions. Herodotus tells the tale in full.) Like the descendants of other great empires, Iranians want to recover past glory. That helps impel perceptions that Iran’s navy must mount a forward defense in the Arabian Sea, ushering the United States out of the region. Another honor-related factor at work is that SSNs are just plain cool. Ships fire imaginations, bewitching leaders and ordinary citizens. Or, as Theodore Roosevelt’s biographer Howard K. Beale wrote, it’s “such fun to have a big navy,” and the gee-whiz warships that constitute one. Ships are a token of great power. They embody national honor. Great powers deploy SSNs, and so the Islamic Republic must have them. Thucydides might or might not agree with the strategic logic of an Iranian SSN force. But he would instantly comprehend Iranian motives. We should do no less.